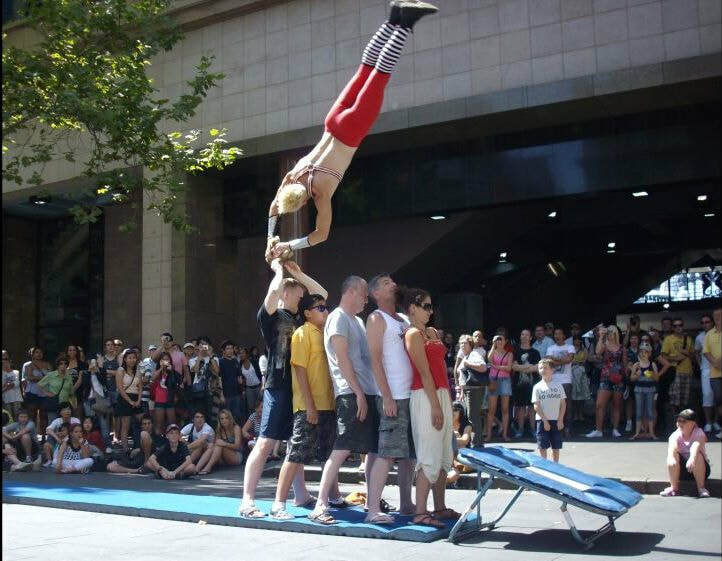 Solid State Circus are experts in Street Performance and Busking policy, practice and enforcement. We work with councils, precinct managers and events to promote a healthy and vibrant live arts culture in public spaces. We offer event or program management services and consultation on street performance and busking policy. Solid State Circus provides entertainment coordination services to Mindil Beach Sunset Markets in Darwin. We manage regular main-stage music acts and buskers for the twice-weekly market, and coordinate additional entertainment for special events and school holidays. Solid State Circus has worked with the National Folk Festival to coordinate their Street Performers, promoting a smooth flow of pedestrians around the festival and positive cooperation between musicians, circus performers, roving bands and Morris dancers. Solid State Circus Director Hemlock Mejarne has over 25 years experience working on street performance practice and policy. He is the national coordinator of the PASS (Peer Assessment for Street Saftey) Program, sits on the street performance advisory committee for Sydney City Council and offers consultation to other councils & precincts around Australia. For advice on creating or updating busking policies, give Hemlock a call.